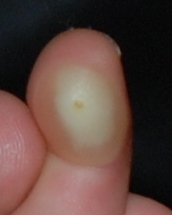 My 3 year old daughter came to me with a blister on her finger yesterday, as far as I know she didn't burn it on anything or have any trauma to it. My husband tried draining it yesterday, he said it was full of pus, kind of yellow, but full of liquid. There is a pin hole spot in the middle of it, he said he didn't make that mark, but that's where the fluid was coming out. We bandaged it and everything. Today its filled again and almost twice the size that it was yesterday. Is this just a normal blister that we should leave alone? Or something we should take her to the doctor for? I would definitely take her to the doctor. She may have gotten into something that you are not aware of. At this age their little fingers can get caught in places that you would never even think of. It can take a day before a blister may show up. So it could have happened days ago. Funny thing about kids is they won't always cry if something happens. Especially if it was on a toy or something they are having fun with. I would not drain anymore pus from it and get to the doctor! We ended up taking her to the doctor as it got so large it was down her whole finger. It ended up bursting on the way there, it was all black and blue underneath where the blister had been. The doctor said it was a burn, most likely electrical from playing with an outlet or something along those lines. Went and checked upstairs and low and behold, she had managed to get one of the safety covers off an outlet in her room. Still not positive she got the burn from messing with it, but thats what evidence was pointing to. Doctor prescribed her medicated ointment and its starting to heal up! Join in and write your own page! It's easy to do. How? Simply click here to return to Child Health.